Heat the olive oil in a pan. Add the garlic, cilantro, green onion, salt and pepper and cook over low heat for 2-3 minutes. Set the food aside. Place the tortillas one at a time in the pan and heat them for 2 minutes on each side. It’s nice to do this because heat makes the tortillas crisp, preventing them from becoming soggy when you add the goat cheese. 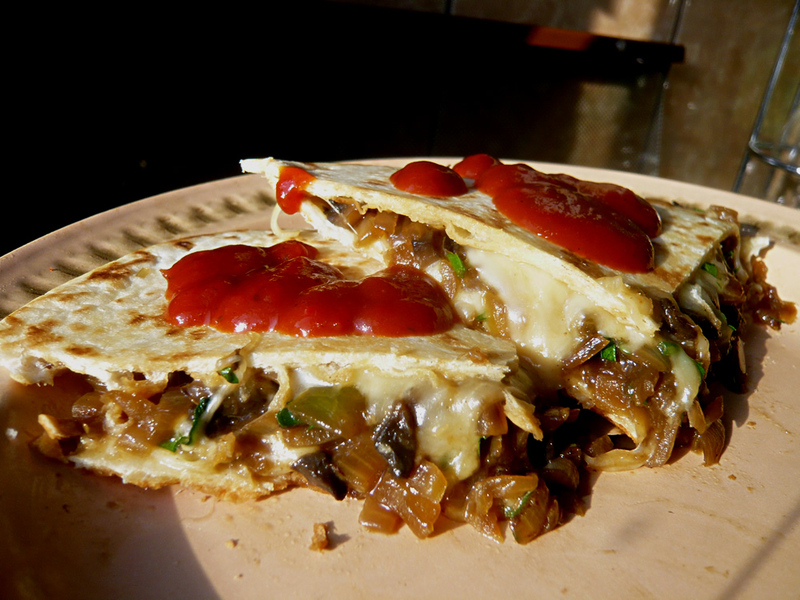 Assemble the quesadillas as follows: one tortilla, crumbled goat cheese evenly spread on top of it, then the garlic and green onion mixture, then some fresh cilantro. Spread another layer of goat cheese, then cover with the second tortilla. Heat the grill pan. Cook the assembled quesadilla for about 2-3 minutes, flip it over carefully, then cook it for about 30 seconds on the second side. Repeat with the second one. Cut in wedges and serve with fresh cilantro and sour cream spread on top.